I would stand in silence surrounded by Lopezes speaking at me in Spanish and respond with looks of sheer horror or an occasional head nod that really meant nothing. From that point on, I not only knew that I needed to learn what they were saying, but I also wanted to learn. Learning a language has never proven easy for me, so my best way to go about this was by making words up. I began by using the same Spanish verbs repeatedly to form random sentences (querer (to want) and poder (to be able)…you know the drill) intertwined with English words pronounced like Spanish words. Some of them had to be real words…right?! That was, until the trobulo incident. We all know how common it is to use the phrase “I’m in trouble” about an array of topics in the states and I wanted to be able to say it in Spanish. Instead of making the word up I decided to ask a friend and was told that the word for trouble was trobulo. So I walked around base for a week saying esoty en trobulo numerous times to several people and didn’t really acknowledge the smirks or giggles, until one day, a nice Tica told me that trobulo was not a word, not even close. And my “friend” had actually wanted to mess with me and teach me an underlying lesson that I should use the resources around me (converse with Ticos, go to classes, look in the Spanish/English dictionary) rather than make up my own language. It was the push I needed to actually learn real Spanish from real Costa Ricans. Now rather than staring at the Lopezes blankly I can joke around with them like family. Que suerte. But, don’t get me wrong, I still love my Spanglish. We found our base from space! It may be hard to believe that it's possible to find our CRROBS base on Google Earth, given that we are in the middle of the rain forest covered by trees, but we did it. This is proof to the world that we do, in fact, exist. Yes, that's right. You did not mis-read that address. There are not many street names, nor are there numbers. "Official addresses" include landmarks, bus stops, and meter measurements from those places. So in conclusion, this search took some effort, but we found it... for you. 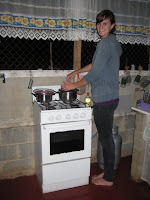 Many of us did a "homestay" at a "Mestizo" village. But most of us did not know what that meant until we got there. 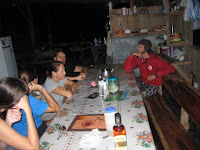 Now we understand that a "homestay" is staying with a local family to better learn the local lifestyle. And "Mestizo" is a term for a culture of people in Latin America who come from a combination of European, American, and Indian ancestry. Actually, about 94% of the Costa Rica population is Mestizo/white combination! Another word we heard a lot was "indigenous" culture (referring to the Mestizo people), and we found out that it is a way to describe the original settlers in an area. The best part about learning all of this was that we were not in a classroom. The knowledge came from hiking there, meeting the families, helping them on the farm, playing on their land (in the river, down the waterfall, or on the soccer field), cooking the food, and sharing language. Your perspective changes a bit when you come from a city where you can ride to the grocery store in a few minutes to grab a snack, then go to a village where it takes 2 hours by jeep then 3 hours on foot. You think twice before you say "I want some milk." But you definitely appreciate that milk more after you slaved for hours to acquire a few drops of milk from a cow (while the indigenous people squeeze out a bucket-full in no time). Maybe my lack of skill came from the 4:30am rooster wake-up calls. There's no room for exhaustion when you have clothes to clean, waterfalls to repel, sugar cane to cut and carry, and rivers to swim. Mestizos make it look too easy.